A big range of sprinklers for any size garden, with quality fittings and heavy duty construction. Privacy Screens will be made to order . Sizes range from a small window to a entire building or full yard. Wetems Garden Products are made to last! Heavy duty construction and powdercoated for durability, our range of garden products and pet beds offer value for money and long lasting reliability. Best of all Wetems are completely Australian made and owned. When you buy from Wetems you are supporting our local economy. 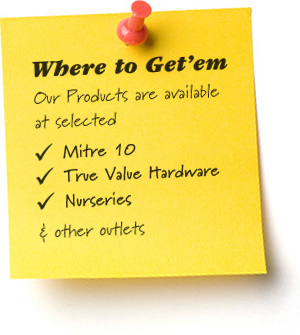 Wetems Garden Products are constructed in Hervey Bay, Queensland by Bay Powder Coating. Bay Powder Coating have been supplying finishes through Queensland for over 10 years. Our products are designed, manufactured, degreased, sand blasted, phosphate conversion coated, powder coated, assembled and packed for shipping, all locally at our Industrial complex.